Today I did an incredibly crazy thing. 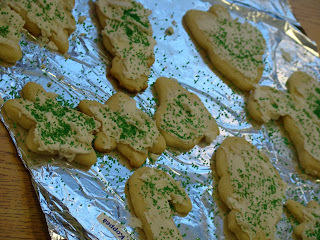 My class made sugar cookies from scratch. Yep. SCRATCH. 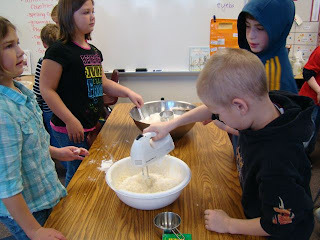 We used 10 sticks of butter, 10 eggs, 10 cups of sugar and 20 cups of flour. Baking powder, salt, and vanilla. 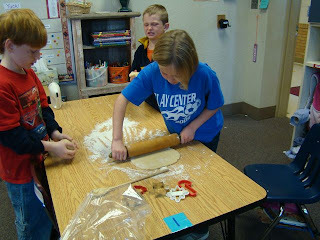 Hand mixers, rolling pins, and cookie cutters. Can I just say....MY CLASS ROCKED!! It was a pretty amazing day in the Hays Team. 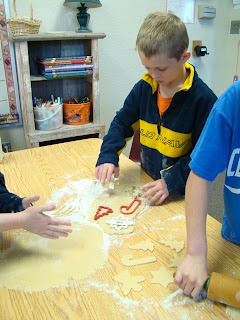 Each child made 12 cut-out cookies and frosted them to take home. 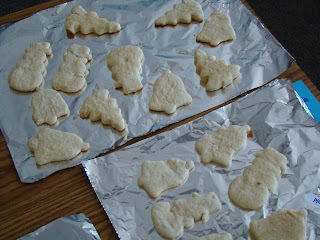 I didn't let them eat ANY at school because I really wanted them to take them home as a gift to their families. Most of them made it home. And I didn't do this by myself. 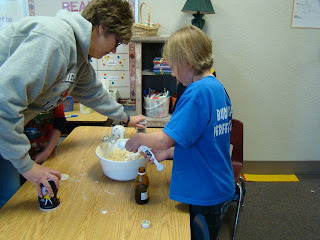 I had some super help--a good friend whose child is finally in my class and a wonderful para who isn't afraid to jump right into anything I want to try. (Monday we made Latkes!) Thanks, ladies--it wouldn't have happened without you. Oh, and I should mention my student aide, Sean. He did my cruddy jobs all while shaking his head at me and repeating nutsnutsnuts. unless there is moisture coming down in sheets. They cleared that slab and out we went--if kids bring snow boots they can go off the slab. I think that there must be nothing better than being a kid with 12 inches of snow on the ground and friends who wanna play. I have had this quilt for many years. I used it on my bed when I was in college--but it was old even then. I am not sure where it came from but I suspect it was my Great Grandma Ringer's. My youngest daughter used it for a long time on her bed. It became just too frail to use on a bed so I have had it stored for awhile. I used the good parts and made this tote bag. You have no idea how impressed I am with myself. It really is cool--I took it to school today to show my friends and they were very impressed. I think I have enough good quilt left that I can make another bag slightly larger than this one. I am contemplating making it my purse. I am still working on how to add a piece inside that would make a divider, possibly with a zipper, because I really like a purse with dividers. I always thought that was the true sign of an old lady--someone who carried a purse with dividers--now I realize that it is the sign of a well organized woman of a certain age. Just sayin'. Oh my Kelli. I cannot believe you made such beautiful things out of old quilts. That tote bag is cool and I LOVE the tree skirt, that is so special.